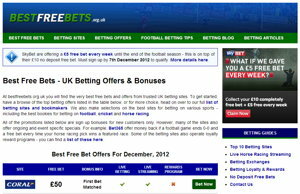 Best Free Bets was my first free bets site, as well as being my first site dedicated to sports betting. The aim of this site is pretty straight forward – to provide UK punters with a quick and easy way of comparing free bets. For this reason I chose to stick the majority of the offers in a table on the home page. As well as the free bets, the site features a weekly football tips section where one of my writers does a round up of the weekends most interesting premiership games. The most recent addition to the site is the betting offers section that lists promotions for existing customers – such as money back specials and refunds. At the moment the section focuses on offers from a small number of bookies that also last for a decent amount of time rather than short-term match specific offers, but if successful I will expand it to include all offers. The section works by pulling in a feed from the blog along with a custom excerpt and expiry date. The excerpts are then show until the expiry date, after which they are automatically removed from the page (but remain in the blog). The excerpts will also get pulled into the relevant bookies page (eg: Bet365 promos will show on the Bet365 page) – this is something that’s been on my to-do list for a while, but I never seem to get around to it.